Moolavar Veeraraghavan gives darshan with His right hand blessing . Salihotra Maharishi and the left hand in Gnana Mudra preaching Nanmughan (Brahma). The Lord gave darshan to Salihotra Maharishi and enquired about the right place to take avatar, hence this place is called Tiru Evvul (Evvul - which place). The Lord protected the tapavasis and vedavits at this place killing Madukaidapas. It is believed that all diseases and troubles will disappear if devotees after taking bath in Hruthapanasha Pushkarni and has the darshan of Vijaykoti Vimanam and the Lord and hence the Lord is also called the Vaidya Narayanan. Thirumangaialwar - 1058-1067, 2674 (116). Well Serviced by road and rail network from Chennai. 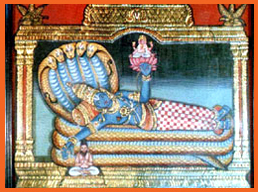 The Moolavar of this sthalam is Veeraraghava Perumal also called as Vaithiya Veeraraghavan. Moolavar in sleeping position (Bujanga Sayanam) facing east direction. Prakthyaksham for Salihothra Munivar. . This temple is situated in Tamil Nadu. 30 miles from chenni in North west direction, 3 kms away from Thiruvallore Railway Station, which is in between Chennai to Arakkonam Railway lane. Plenty of bus facility available.